I had every intention about blogging this last night, but I was pretty sleepy. I actually thought I posted more progress of the 9 to 5 sock I was working on, but I guess I only intended to do it and didn’t actually get it done! I’m batting a thousand today, aren’t I? So, I’m here now and I have knitting to show and talk about and also some life stuff to mention. I’ll go with the life stuff first, then on to the knitting content. Life has been keeping me on my toes. I’ve had some changes to adjust to recently that have made things interesting. Been working with my doctor with some health things and trying to get the insurance company to pay for my medication. It’s been FUN! Okay, maybe I’m lying about that just a little. Anyhow, there is some good news that came my way Wednesday! I applied for a job some time ago and I hadn’t heard back from them. Mind you, I really wasn’t looking for a job, Nick happened to see the posting for it and practically begged me to apply (it’s a government job, great benefits and pay), so I did thinking that I wouldn’t get it. When I didn’t hear back about it, I figured the position had been filled. I wasn’t worried about it. Then, like 2 months after I applied, they called for an interview! I was shocked. I went to the interview, thought I did well, but still didn’t think they’d hire me. A week later, they let me know I made it to phase two and asked me to fill out some paperwork. That happened last Wednesday and then Wednesday of this week they called and made me the job offer!! I was shocked! I could barely contain my excitement about it. This job is a blessing for me – it will be better hours, pay and benefits and my commute will only be slightly longer (we’re talking maybe 5 to 10 mins at the most). The stress will less, too, which will be fantastic for me health wise. I gave my notice soon after I found out and my last day will be next Friday. Honestly, I’m sad to go because I do like a lot of the people I work with here, but I know it’s the best move for me. Now for the knitting content. About a month ago I discovered that my mittens were nowhere to be found. I figured they’d turn up before the weather got real cold, but I haven’t found them after looking high and low. I have accepted that they are gone (or just really well hidden). My hands have been FREEZING with this cold weather and I finally gave in and started a new pair. 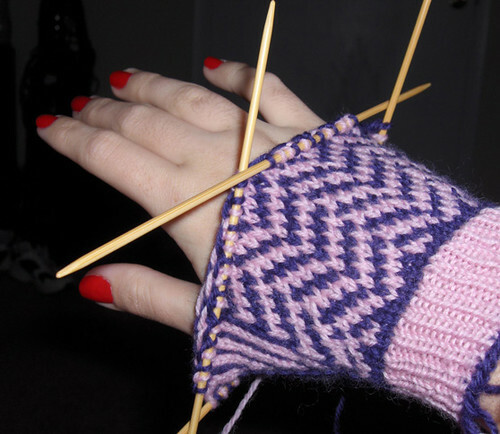 When Elliphantom posted the pattern for the Herringbone Mittens, I wanted a pair pretty badly. I bought some worsted weight Patons two weeks ago and attempted the pattern on smaller needles because I have really small hands. I figured going down a few needle sizes would probably remedy this, so I gave it a go. 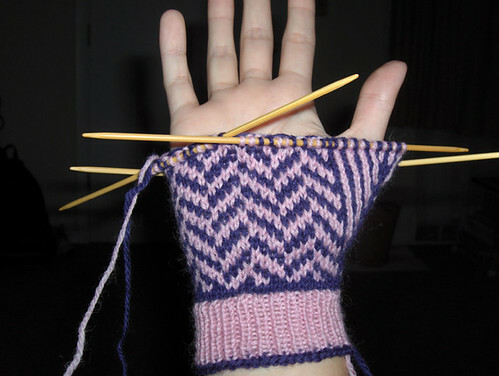 Well… after knitting the cuff of the mitten, I realized that I could fit BOTH hands through it with room to spare. I put it down and thought it over for a week, then got out some sport yarn I had in my stash in pink and purple. I like the colors together and I estimated I’d have enough to make a pair of mittens from the yarn. I pulled out sets US 1 and US 2 DPN’s and got to work over this past weekend. They fit my small hands perfectly now! I love these mittens! It took a while to get the chart down, but now I can pretty much work on it without looking at the chart constantly and they seem to be flowing well (I can figure out what comes next by looking at it). 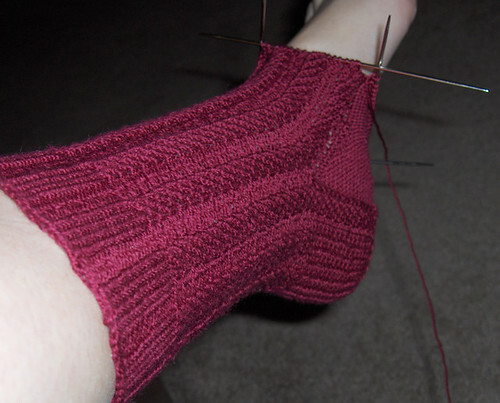 I’ve also been working on my Nine to Five sock. I’m about half way down the foot of the sock right now, though I haven’t worked on it much this week as my knitting time was taken over by the above mitten. Next Post An FO and an update.